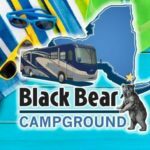 Minutes away from the ocean and white sandy beaches of desirable Salisbury Beach, MA, Black Bear Campground offers a family campground with 200 sites for Tents and RVs. 20 Pullthroughs. Rates available by the day, month or season. RV length unlimited. 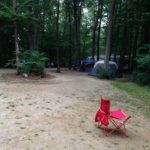 All sites feature a fire place and picnic table from the basic tent site to the full hookup sites for the RVs. Amenities include large playground, 2 pools, rec hall, basketball, volley ball, horseshoes, laundry facilities, bath houses and free wifi. Come and enjoy our friendly, clean campground for your excursion, and so close to the beach! Salisbury Beach overlooks the point at which the Merrimack River feeds the Atlantic Ocean. It’s a great place to swim, boat, or camp.